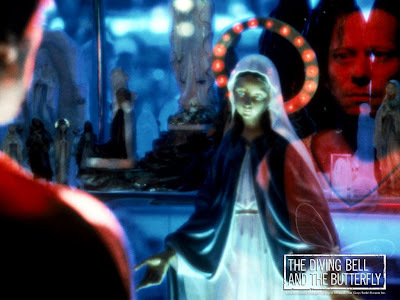 If you're keen to watch a film that might get close to changing your life, even in some minor way, then I recommend watching 'The Diving Bell and the Butterfly'. Directed by Julian Schnabel, an artist whom I've always admired, and based on the true story of Jean-Dominique Bauby, editor of French ELLE magazine in the 1990s. In a sentence, this guy has a stroke and becomes paralyzed and writes a book by only communicating via blinking his left eye. I won't say anything else other than I really recommend watching it. Also, I'm desperate for a copy of Jean-Dominique Bauby's memoirs - the real life one, because I feel my mind will be further blown to smithereens. Ebay here I come.